Today’s workout was quite a sweaty one! I wasn’t doing anything particularly crazy, but there’s something about interval training that leaves me looking like a hot mess. 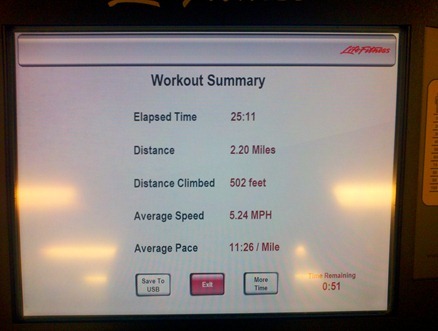 Covering slightly more than two miles when I only ran for seven of the 25 minutes isn’t too shabby if you ask me! I rounded out my workout for the day with 10 minutes on the elliptical and a short walk with Miss Sadie. Breakfast this morning was easy peasy thanks to some legwork last night. 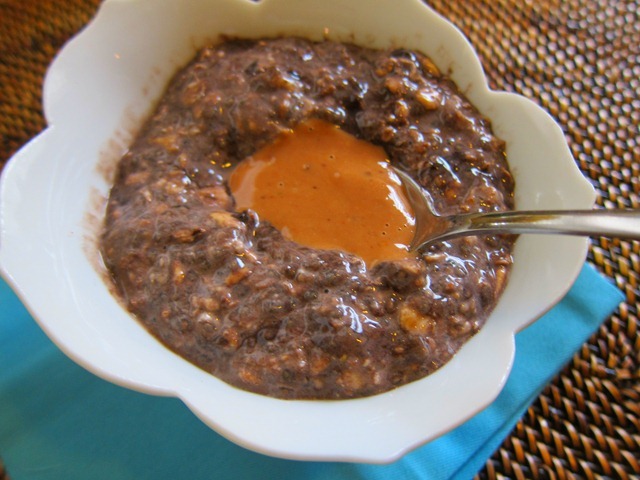 Chocolate peanut butter overnight oats, baby! 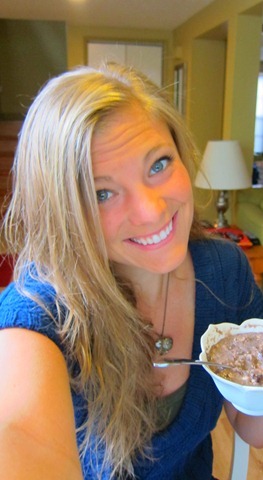 I simply grabbed my prepped overnight oats from the fridge, added a spoonful of chocolate PB2 to the mix and chowed down this morning while reading blog emails (thank you so much to Laura, Jane, Andrea and Kristen for your amazing email guides for my trip to Europe!) and typing up this post. you and me both. i look at their houses and then i look at my own and i feel like i live in a cluttered shanty. Overnight oats are my most favorite breakfast. I need to try this version! Yum! Jay and I are ALSO trying to convince our families to move to North Carolina!! We’d go in a heartbeat, but we can’t fathom leaving behind our families…hopefully they’ll hop on board soon, because I am READY! I’m an NC girl living in ATL and both our families live in NC so it’s my husband that I try to convince. It would be nice to live back in a state that has all four seasons! I love ATL but NC will always be home! Breakfast looks delicious! 🙂 I always blog while I’m eating. Haha. you are clearly more talented at multitasking than I am. If food is in front of me I’m WAYYY too focused on inhaling it to think about anything else, much less blogging. I need to start doing overnight oats! I’m so busy in the morning that I never make myself a quality breakfast. Hopefully this delicious bowl will inspire me. I also want to buy PB2 – I’ve been hearing about it a lot but have yet to buy it. Perhaps today will be the day! YUM! Those oats look awesome! I think I’ll try that tomorrow, I’ve yet to have overnight oats that include chocolate! I have been hooked on overnight oats because of you!! This week I have been rocking the blueberry overnight oats. SO YUM! What a great looking breakfast! 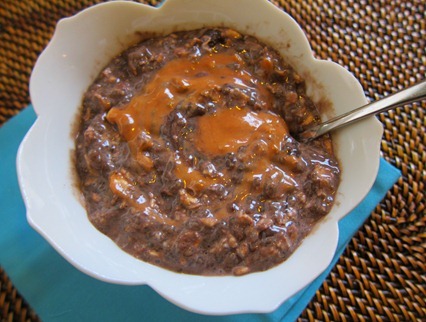 Last week I had sweet potato over night oats, they were so delish. I fyou move to NC and your family comes to visit they will fall in love it and move there too. Mt father in law came to Montana when my husband and I moved here and fell in love with so much I am pretty sure he will be selling his retirement land in NC and move to MT! MMM Julie this looks awesome! I need to get some PB2. Is it similar to Peanut Flour? chia seeds just give me the creeps! sigh–as i know they are so good for you. As a girl from North Carolina, I have to say it is amazing! Just FYI! PS- I just started following your blog recently, and you have totally inspired me! I ran my first 5K a few weeks ago! And I am working on training for a 10K! that makes me so happy! congrats, jennifer!!! good luck in your 10k! I’m making overnight oats like this tonight! Give me chocolate peanut butter anything and I’m all in! My mom is from north caroline.. it is so pretty there! Where in North Carolina do you want to move? P.S Those oats look fantastic! i’d go anywhere! i love charlotte, raleigh and asheville. so, so pretty. i always eat when i blog haha! LOVE your oats- im thinking its oats for dinner tonight! 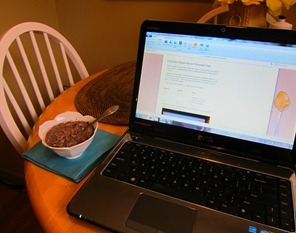 I feel like blogging and eating just go together!!!! I have heard that magazine called “Better THAN YOUR Homes and Gardens” lol! I want to move to NC too but i have the same dilema of convincing my family! I went to college in NC and miss it terribly. Do you think you would miss the florida weather if you moved more north? Hi Julie! I love your blog…you are too cute, and so is Sadie! You should totally move to NC, it’s great here! I’m in Raleigh and would be happy to give you any info if you ever need it! I’ve only tried overnight oats once before – the texture seemed odd to me. I might have to try yours because it looks delicious! Love chocolate overnight oats. Chias always taste kind of weird to me without cocoa powder! I always eat while blogging/reading/tweeting. It’s a bad habit, but since I keep my computer at my kitchen table, it’s hard not to! I’m hopeless at home decorating. If I ever buy a house I think I’ll have to hire someone. That sounds SO good! Like those chocolate peanut butter no bakes but in a bowl. yummm!! 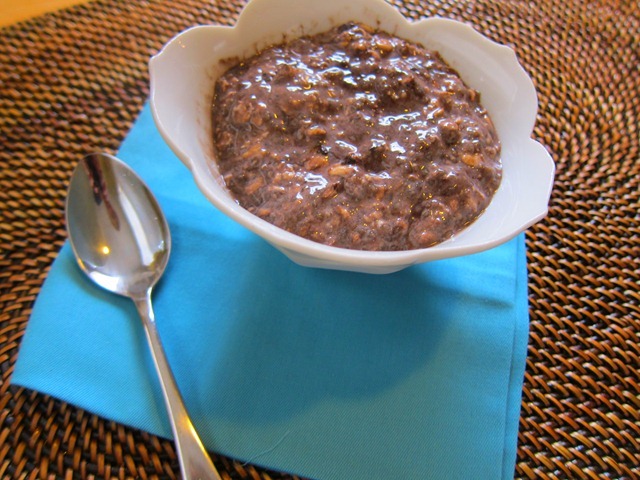 I love overnight oats, I have to try making them with cocoa! Nothing would ever make the PB/chocolate combination less than amazing… might as well fit it in to breakfast! I am the same way. I am such a multi tasker. Eat, blog, study, clean…etc. Honesty it’s ridiculous how much i try to cram into every minute of my day. haha! Same here! I always eat when I blog! Or when I’m commenting! Right now I’m eating oatmeal! Don’t you just lurrrve how PB “melts” into oatmeal? mmm! Yum!! I miss overnight oats!! I always blog while I eat – its the best time to do it!! I made overnight oats for this mrning and I was FREEEZING eating them. Guess it’s not time yet! Sometimes sweating buckets and looking like a hot mess is the only way to fly!